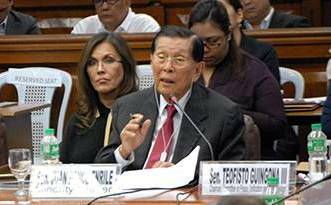 Sen. Juan Ponce Enrile did not deliver promised bombshell for reasons known only to him. He labored, however, to give nation sequential texts from various personalities that reinforced his theory: that P-Noy was in the thick of planning and executing Mamasapano plot, together with suspended Gen. Purisima, with Director Napenas as fall guy. Senate divided over loyalty to P-Noy, as AFP and PNP are over Oplan Exodus. Listening to the seven-hour hearing of the Senate committee on public order and dangerous drugs chaired by Sen. Grace Poe last Tuesday, Jan. 26, on the SAF's "Oplan Exodus," I felt great sadness. At one point I could not help myself---I wept. Having been a military wife for several decades it was quite painful for me to see officials of the two national security agencies of government---the PNP and the AFP---trade barbs and blame each other for the Mamasapano debacle before the entire nation. I am sure that for many military officers and men, active and retired, as well as their families, the blame-game and public expose of security weaknesses and flaws proved to be a nightmare. I pitied especially the military as they learned of the SAF's venture into the lion’s den late in the day and when they were called to rescue the trapped men, details from the PNP were vastly incomplete. Yet the AFP officials had to bear much of the blame especially from Minority Leader Juan Ponce Enrile, who had jurisdiction of both agencies for 17 years in the Marcos regime. I also pitied the PNP officials, led by then acting PNP OIC Leonardo Espina, who were kept out of the loop on Mamasapano but who had to share the onus of blame and shame for the indefensible secret plot hatched by President Aquino and his cohort, suspended PNP Chief Alan Purisima, and their fall-guy, SAF Chief Getulio Napenas. Last Tuesday’s Senate hearing was called at the behest of Sen. Enrile who claimed to have new information on Mamasapano. The nation stood still that day, glued to radio and TV---with majority of senators present, as were top brass of the PNP and AFP, including officers just retired, who had played significant roles in that monumental debacle. Media hyped the anticipated exposes of Enrile but when he stuck mostly to revelations of text messages exchanged through that fateful day, the public was disappointed. I presume that the tape supposedly of a conversation between a lawmaker and a PNP official on the debacle was keenly anticipated, and when it was not presented by JPE, folks began to ask if he was daunted by the threat of Senate President Franklin Drilon that unauthorized use of tapes could be subject to penalty under the "Anti-Wire-Tapping Law." JPE might have asked himself if he’s prepared for another lawsuit that could return him to hospital arrest. But Enrile nonetheless came very prepared. Instead of the bombshell tape, he revealed verbatim text messages culled from subpoenaed cellphones of major players in the Mamasapano drama, beginning with President Aquino. He used the texts to establish not only the sequence of events, but also the role of the dramatis personae. Most important of all, the texts showed President Aquino’s lead role in the SAF operation on Marwan---where before it was only the narration of Napenas about how he and suspended PNP Gen. Alan Purisima were called to Bahay Pangarap on Jan. 9, 2015 to finalize details of the SAF operation. The texts of various officials, as revealed by JPE, showed that P-Noy was on top of the SAF operation drawn up by Purisima and Napenas and that he approved it---even though P-Noy’s loyalists at the Senate, led by Senate Chief Franklin Drilon and including Senators Bam Aquino, Antonio Trillanes and Sonny Angara, exerted every effort to make Napenas the fall guy. Moreover, the texts revealed that the President knew quite early about the fate of the entrapped SAF commandoes---having been apprised by DILG Secretary Mar Roxas, who knew nothing about it previously, just prior to their flight to Zamboanga that early morning. What was interesting was that once in the plane and on arrival in Zamboanga, the President’s cellphone quieted down and no reaction was obtained from him by text. As DILG Secretary Roxas noted, in response to a query from Enrile, everything seemed “normal” on the plane and in Zambo---although some media people who were with his party were later quoted as saying that P-Noy appeared quite stunned by what was happening to the SAF men. The bigger drama at the Senate hearing involved the efforts of both PNP and AFP leaders to escape blame for the SAF debacle---recorded in texts as early as the first waking hours of that fateful day. The AFP officials, led by former Chief Gregorio Catapang, understandably sought to exculpate their branch of service from blame in a prepared presentation. They argued that they knew nothing about the on-going SAF operation until the PNP commandoes ran into deep trouble. The AFP officials stressed that they were hindered from rescuing by the lack of information from the SAF command as well as in the field on such details as troop positions and strength, civilian population density, etc. ; besides, tanks couldn't venture into marshy terrain. At that point, many viewers began to wonder if all the excuses offered by the military were not simply politesse in lieu of outright admission of a stand-down order on the AFP---which its commanders uniformly denied. As PNP and AFP officials tossed blame to and fro like a ping-pong game, Enrile suddenly blurted out, “Kasi nakialam ang Presidente ninyo!” That reflex statement, followed minutes later with another scathing "Someone's lying out here," drew tense reactions from committee chair Grace Poe and Senate Chief Drilon. One could slice the tension. For decades the AFP and PNP have worked relatively well but the SAF operation in Mamasapano that fateful Jan. 25 a year ago sadly put these two armed services at odds with each other--- because, as JPE stressed, President Aquino chose to compartmentalize the operation (JPE kept calling it “compartmentation”). Why this operation was undertaken by the PNP’s Special Action Force in the marshy terrain of Mamasapano that was perhaps better suited to the Army’s infantry provokes more queries than answers. Could it be because, as former SAF commander Napenas pointed out, the AFP "is compromised?” What exactly did that mean? Did it have anything to do with, as Napenas also noted in response to a senator's query, the fact that US forces supplied training, equipment and personnel , as well as the bounty of $5 million for the head of Marwan, the Malaysian terrorist wanted for the Bali bombing of 2004, that killed many people, including some 200 Americans and Australians? P-Noy is noted for his fierce loyalty to people he has known for years. This could be the reason Gen. Alan Purisima, who at that time was serving suspension from the Ombudsman on graft charges, was handpicked to carry out the mission planning and execution (not just the role of “facilitator” as he claimed about himself). On that fateful day, however, to add more weird details, Purisima was monitoring Oplan Exodus from his Nueva Ecija home by text! Interestingly, too, acting OIC PNP Chief Leonardo Espina, who replaced the suspended Purisima, was kept out of the loop despite his excellent reputation; the entire hearing must have been so painful for him. But it was not only Espina who was shut out: Mar Roxas and Voltaire Gazmin, charged with the nation’s internal and external security, had no idea whatsoever of what was cooking at Bahay Pangarap, until the whole thing blew up in everyone’s faces. JPE went hyperbolic on this fact. Mamasapano was the kind of plot that has practically no answers but all questions---and insane ones at that. As I listened to last Wednesday's Senate hearing unfold, I couldn’t help but think of the US plot to get international terrorist chief Osama Bin Laden somewhere in Pakistan a few years ago---one of the most daring feats ever carried out in the spy world. I imagine it must have taken many weeks of planning and very tight, clandestine coordination among various agencies of the US government. There was just no room for mistakes. Its success took the world's breath away! Mamasapano, by contrast, seemed fated to suffer mistakes because it was so amateurishly planned and carried out by only three bumbling people. Unfortunately 44 SAF lives were lost owing to their blunders and the memory of those heroic commandos who rode into the valley of death will haunt the nation for a long time. The inevitable happened at SC's first hearing on Grace Poe's DQ as candidate for president: Justice Diosdado Peralta raised query that she could be the daughter of an Ilocano "or even an Ilonggo like me"---if DNA tests were to be run again. Thus, this issue that has been bruited about in whispers came to fore at SC, drawing faint murmurs and even snickers. Historic photo of opposition reunion in martial law years---with passing of Nap Rama, all of them now united in Great Beyond. Yesterday, Tuesday, Jan. 19, the inevitable---and perhaps the unthinkable---happened at the Supreme Court during the hearing on several petitions to disqualify Sen. Grace Poe from running for President. Associate Justice Diosdado Peralta, famous for his at times irrepressible sense of humor, tossed to Poe’s counsel, Alexander Poblador, a sensible question: why not just present findings of DNA tests run on the senator and her relatives which are 99.99% accurate, to end the issue of whether she's a natural-born Filipino or not? While the Constitution firmly stipulates that only natural-born Filipinos can run for representative, senator, Vice-President and President of the Philippines, local jurisprudence accepts that if a foundling can present a DNA-certified blood relationship to a natural-born Filipino, this issue becomes moot and academic. At the mention of a possible Ilocano relation of Poe, the SC hall reverberated with audible murmurs as well as some snickers, for it has been whispered about in various circles for some time now that Grace Poe is secretly a child of the late President Ferdinand Marcos with a popular actress at that time. In the Senate, in fact, it is a well-known joke so that Sen. Ferdinand “Bongbong” Marcos Jr. and Sen. Poe at times like to refer to each other in a sporting way as “Brod” and “Sis.” Recall that some weeks back, Bongbong challenged Poe in a joking manner to submit to a DNA test together, which the senadora simply deadma-ed. On the other hand, Poe went to some length to undergo a DNA test with some folks in Iloilo who may be related to her, but it proved negative. Word from her camp is that she continues to look for relatives who could provide that vital key to her candidacy. But what if suddenly she turns around and accepts Bongbong's challenge and their DNA tests turn out positive? I suspect that Poe does not want to entertain that possibility because her being related to the late martial law dictator could dilute her present clean and well-scrubbed political image. Interestingly, her adoptive mother, Susan Roces Poe, wife of FPJ, attended the SC hearing with her, and they stayed for over an hour, after which Grace excused herself to attend Senate session. Looking at the still attractive and well-coiffed Susan Roces sitting there and very serious in mien, a thought entered my mind: what if she and Grace underwent a DNA test and it turned out positive? It would only confirm what's being bruited about in speculations---that the senadora could be the daughter of Susan's sister, Rosemarie Sonora. Yesterday's hearing at the SC was long drawn out and exhaustive, where aside from the recurring debates on Poe's natural-born status or the lack of it, many details were brought out by the Justices on the second issue bedeviling her. This is the residency issue that should support her claim to having renounced her US citizenship at a certain time, in order to establish domicile here. There were a number of inconsistencies, however, in dates involving use of her American passport, which was especially explored by the very persistent Associate Justice Teresita Leonardo de Castro but which Poe's counsel, Alex Poblador, tried to heroically overturn. De Castro stressed, for instance, that the fact that the DSWD initiates the process to prove that a child is a foundling proves that contrary to the argument of the Poe camp, THERE IS A PROCESS THAT SHE HAS TO UNDERGO to prove her natural-born status---that in fact "birthrate citizenship" does not apply in her case; rather, it is citizenship by law. In other words, what Justice De Castro was saying was that all the procedures being resorted to now in Poe's candidacy seem to contravene Sec. 2 of Article IV on "Citizenship," which says that "Natural-born citizens are those who are citizens of the Philippines from birth WITHOUT HAVING TO PERFORM ANY ACT TO ACQUIRE OR PERFECT THEIR PHILIPPINE CITIZENSHIP." (emphasis BOC's). Poe's lawyer Poblador, however, preferred to refer to it as "a series of incremental acts," and "an incremental process." In the end it all boiled down to what was admitted by lawyer Poblador and the Poe camp: that the inconsistencies in her record---her re-acquisition of PH citizenship through her oath of allegiance on July 7, 2006, her renunciation of her US citizenship on Oct. 20, 2010 but her continued use of her US passport up to July 2011, and the loss of her US citizenship in Dec. 2011, when the US Embassy in Manila issued a "certificate of loss of nationality of the US"---all constituted "honest mistakes." But such admission only seem to confuse the justices even more. Whatever it is, Poe is in a jam at the moment, judging from the way her ratings continue to slide down, doubtless due to the uncertainty of her qualifying for the presidential race. Financiers certainly could be hesitant in contributing more to her campaign. I saw Isabela Rep. Georgiddi Aggabao at the SC hearing yesterday and he stressed that a faction of the NPC is backing up Poe and of course, it hopes everything turns out right for her. But if the party supporting Grace Poe is quite worried about the result of the SC deliberations, it certainly is not showing it. The first SC session to hear all three private petitions seeking her DQ was held yesterday, Jan. 19, with Poe's lawyer Poblador taking the stand for a good three hours; the next one is scheduled for next Tuesday, Jan. 26. To kick off the SC session, her supporters held a mammoth, bouyant rally in front of the SC yesterday---jamming the entire area from Paco Park all the way to Padre Faura. Grace Poe's ratings may be going down where once she was neck-to-neck with Vice President Jejomar Binay (the latter now has a 7-point lead over Poe in the four-candidate race), but it seems she still has substantial funding. There were a lot of young students in her rally crowds, but there were also the usual hakot crowds with their children in tow. My fearless prediction, if the line of interpellation by the justices in yesterday's proceedings is any indication: the SC would thumb down Poe's candidacy. Unless, as rumor is going around, that the Palace is now shifting to Poe in view of Mar Roxas' unspectacular performance in surveys. Playing the Grace Poe card could complicate matters even in the SC. The photo below is quite historic as it presents in one picture all the leading opposition leaders during the martial law years under President Marcos, who were all imprisoned by the dictator at Fort Bonifacio after he declared martial law in 1972. The occasion shown below was the opposition leaders' very brief reunion when Ninoy Aquino was allowed a 36-hour furlough from prison to celebrate his wedding anniversary with wife Cory---an occasion obtained through the ministration of Jaime Cardinal Sin. Years later, these opposition leaders were to campaign under the Laban Party In the desire to participate in the April 7, 1978 elections for the Interim Batasan Pambansa called by Marcos, then under heavy pressure by the Americans to loosen up a bit on his martial rule. This photo taken at Ninoy's Times St. residence shows, from left to right, Teddy Locsin Sr., publisher of the Philippine Free Press; lawyer Francisco "Soc "Rodrigo; Manila Times publisher and chief rallyist Joaquin "Chino" Roces; radio broadcaster Jose Mari Velez, Ninoy Aquino, journalist-lawyer Napoleon Rama; lawyer Jose Wright Diokno, later to become Secretary of Justice under President Cory Aquino, and the bearded Ramon Mitra of Palawan, who was to serve as IBP assemblyman and later a distinguished House Speaker. The great opposition leaders of the martial law years---now all passed on to the Great Beyond. This photo surfaced during the wake last week at the Santuario de San Antonio, of Nap Rama who died at the ripe old age of 92---the last to journey on to the Great Beyond in this historic group shown above. Nap Rama was a fearless and distinguished writer of the Philippine Free Press who also served as Floor Leader of the 50-member Constitutional Commission of 1986 that drew up our present Constitution. Though Nap Rama was much older than myself, I had the privilege to be his friend through the years that I was an active journalist, and we both were part of the "core group" around Speaker Jose de Venecia over the years. My profound condolences to his lovely widow, Paz "Lady" Ramos Rama and their children. Comelec wags assert that Commissioner Guanzon refused to submit her SC memo on Grace Poe's DQ case to Chair Andy Bautista because she treats him as her junior in age. But other wags also note her close links with LP presidential bet Mar Roxas as they both are Western Visayans. Guanzon's appointment may be politically motivated, but so is JPE's request to re-open Mamasapano case---with poetic justice, on Jan. 25, its first anniversary. Chair Poe insists her committee report on Mamasapano can't be revised any more, but trust JPE to try to write new one. The Comelec is in a mess---as are several other crucial offices of government nowadays---and the disunity may be traced mainly to the fact that ex-politicians are appointed to sensitive positions that call for political neutrality, but some appointees cannot seem to be neutral. Take the case of Comelec Commissioner Rowena Guanzon, former mayor of Cadiz, Negros Occidental, who drew up the memorandum for the Comelec en banc that seeks the disqualification (DQ) of Sen. Grace Poe from the May presidential race. The Comelec en banc position merely backed up the posture of its first and second divisions, which sought Poe's DQ owing to the question over her natural-born citizenship status and inconsistencies in her residency. When Commissioner Guanzon went straight to the Supreme Court to submit what was supposed to be the poll body’s en banc memorandum, as ordered by the SC, it made enormous headlines in the outside world. But what went wrong was that, as Comelec Chair Andres Bautista protested loudly, Guanzon did not bother to check that memorandum with him as head of the Comelec. Chair Bautista felt offended by this move and threatened to tell the SC to disregard Guanzon's memorandum, but this only drew a loud rejoinder from the lady commissioner. Said she: “As a Commissioner I’m not a subordinate or employee of Chairman Bautista and he has no control or supervision over me,” and that she has every right to go direct to the SC with the memorandum. I submit that Guanzon is wrong, very wrong from several counts. The Comelec is a collegial body and after the en banc drew up its decision to seek Poe’s DQ from the presidential race and Rowena Guanzon prepared the memorandum for the SC on this decision, she should have had the courtesy of showing the petition in its final form to Chair Andy Bautista, prior to submitting it to the SC and issuing the news item to media. Any organization has to have some kind of a binding structure---and now that the Comelec is running a very tight ship and is in the middle of so many controversial issues, it especially needs to calibrate all its responses. Bautista was so offended that he now threatens to ask the SC to ignore Guanzon’s memo as unauthorized. As a result of this scandalous quarrel inside the Comelec, much is being attached now to the fact that Commissioner Guanzon, who was first appointed OIC mayor of Cadiz by President Cory Aquino and subsequently won that office on her own, is said to be a very close ally of LP presidential candidate Mar Roxas and Senate President Franklin Drilon, as they come from the same Western Visayas region. Guanzon is thought to have made this preemptive move in the SC in order to ensure the DQ of Grace Poe, who, with Vice President Jejomar Binay, lead in the presidential race, while Roxas comes in as a poor fourth after Davao Mayor Rody Duterte. Valenzuela Mayor Rex Gatchalian, Poe’s spokesperson, was quoted by the Tribune as saying that his principal and her camp regard Guanzon as among the “personalities in the Comelec who have a political agenda against Sen. Poe.” No doubt about that, but wags inside the Comelec also note that perhaps Guanzon thought age should prevail over rank: Andy Bau is junior to her in age. 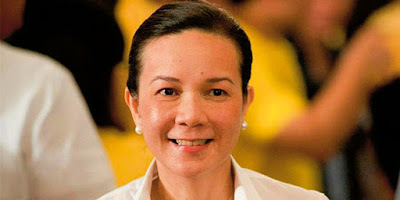 This blogger subscribes entirely to the notion that Sen. Poe is unqualified to run for president of this country due to the twin issues of her inability to prove her status as a natural-born citizen as well as her lack of the ten-year residency---conditions required by the Constitution for presidential candidates. But in this fight between Comelec Chair Bautista and Commissioner Guanzon I can see that the disarray within the poll body stems from the fact that the appointing power, President Aquino, has filled what should be a very sensitive position, such as that within the Comelec's top hierarchy, with a clearly partisan official---when the better thing to do would have been to get lawyers with towering reputation but who are not aligned with any political party. The Comelec in the tenure of Sixto Brillantes and now under Andres Bautista lacks the stature of officials of old, such as Jaime Ferrer and Christian Monsod in earlier decades who were respected highly by the people. 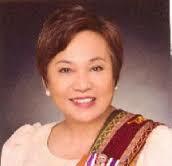 Now you see political pygmies like Rowena Guanzon who are ready to defy logic and common sense for partisan reasons. The Palace fought hard against provisional bail for Sen. Juan Ponce Enrile over the past three years, keeping him in hospital detention due to his ill health and advanced age, for a good reason: if he’s back in the Senate he could wreak a lot of havoc on the P-Noy administration because of his continuing sharp mind, unequaled in the Senate despite his advanced years---as well as his good contacts and links within the military/police developed in the long years he served as Minister of Defense. But with super-lawyer Estelito Mendoza arguing for him, Enrile went to the Supreme Court and won provisional bail---and promptly resumed his seat in the Senate. Now JPE has petitioned the Senate committee on public order, headed by Sen. Grace Poe, to reopen the Mamasapano case, following his claim that he has uncovered new testimonies and findings on this tragedy that rocked the country nearly a year ago. Poe was left with no choice but to agree to the reopening which is set, very much with poetic justice, on Jan. 25---the first anniversary of the Mamasapano Massacre that snuffed the life of 44 members of the PNP's elite Special Action Force (SAF) and a good number of civilians. Sen. Poe had little choice but to acquiesce to JPE's request, but not before emphasizing that the report her committee had prepared nearly a year ago can no longer be changed or revised---as it was signed by no less than 21 senators. Perhaps the old report cannot be changed anymore, but then there will have to be a new report, as JPE claims new evidences he gained, interestingly enough, from some of his fellow detainees at the PNP Hospital inside Camp Crame. Trust Enrile to come prepared as he is a most cunning investigator and a brilliant lawyer. Malacanang quickly termed the re-opening of the Mamasapano hearings "politically motivated" and government agencies such as the NBI were quick to assert that there are no new findings on this case. But politically motivated of course it is, as JPE was detained in the PNP hospital all the time that the hearings on the SAF massacres were being conducted; he will be heard on this issue only for the first time now.